Lake Tahoe golf is recovering nicely from the Angora wildfire that destroyed 254 homes and left TV viewers across the country wrongly thinking all of Tahoe as a fiery catastrophe zone. No, the casinos didn't burn and neither did the golf courses. Lake Tahoe is still ultrablue, as seen here along Edgewood's 17th hole. 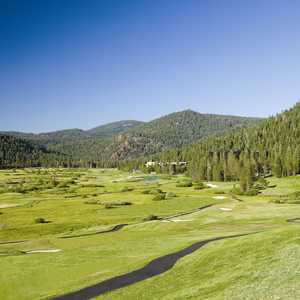 SOUTH LAKE TAHOE, Calif. - Phil Weidinger could get Hitler a prime tee time to golf in Lake Tahoe. Or in today's political climate, he could hook up Michael Vick with great golf in this outdoor vacation paradise. Weidinger is the official spokesman for the Lake Tahoe Visitors Authority, the PR force behind the American Century Celebrity Championship tournament that brings A-listers like Charles Barkley and Lance Armstrong in, the virtual godfather of golf in the high Sierras. If Weidinger can't get you on, it's mission impossible. So imagine his surprise when he called up Edgewood Tahoe Golf Course on a recent afternoon, asked if he could get out late in the day and was told no. Sorry, Phil, but the course is completely sold-out. The guy who knows everybody could only smile at that. Because it means Lake Tahoe golf is recovering nicely from the wildfire that destroyed 254 homes in the region, left TV viewers across the country with images of Tahoe as another smoky, fiery catastrophe zone, and threatened to crush the crucial summer tourist season in the rare West Coast area where the temperatures are comfortable and the scenes often breathtaking. "We're rocking and rolling," Weidinger said. "The fire's not a factor from a tourism standpoint." Which represents quite a difference from the aftermath of the historic blaze. Named the Angora Fire, it started on June 24 and was not contained until July 2, after 3,100 acres and those 254 homes had been burned and thousands had been evacuated. It's one of the 20 most destructive fires ever in California in terms of structural damage, and it left many would-be visitors convinced all of Tahoe was aflame. "We had calls to our office asking if the casinos were on fire," Weidinger said. They weren't. None of the golf courses took a direct hit either. In fact, all of Lake Tahoe's recreational opportunities, from river rafting to mountain biking, went on pretty much as usual. The challenge comes in convincing vacationers that their trip will still be what they expected before they ever heard of the fire. For a place like the Lake Tahoe Golf Course, that means making the message impossible to miss. The front page of the Lake Tahoe Golf Course's Web site features a big note about the course being unaffected by the fire. When you call the course, its automated welcome message mentions the fact there are no fire problems first. It's also repeated again later in the recording. When you're the closest golf course to the fire site, about a mile away by Head Professional Sean McDade's estimation, you cannot be shy about getting the word out. In the first few days of the fire, McDade says that the course was "pretty smoky." Still, the Lake Tahoe Golf Course stayed open the whole time. Only a small band of hard-core regulars played, but there were rounds going on even as trees burned in view of the course and people wondered if they'd have to evacuate. 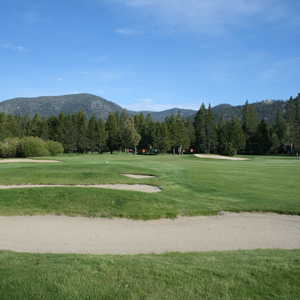 McDade and the rest of the Lake Tahoe Golf Course's management felt it was important to remain open as a symbolic gesture if nothing else. In this town, that type of never-give-up attitude is almost expected. "It is a mountain community," Weidinger said. "There's a pretty tough group of characters up here. They get knocked down and they get right back up." McDade and other head professionals will tell you that they're battling the TV images of the fire much more than any actual fire aftermath. "Definitely, the news coverage hurt us a lot more than the fire," McDade said. "Watch enough of that stuff and you could think that flames were shooting out of Lake Tahoe." As anyone who watched the Celebrity Championship, held just a few weeks after the fire was declared contained can attest, the 22-mile-long wonder that goes as deep as 1,600 feet and stands out as the biggest tourist attraction of all is still almost special-effects-studio-worthy blue. If you're playing Edgewood's 17th, the par-3 that runs right along Lake Tahoe, the view's still stunning. That's the thing. After the massive fire threatened this summer getaway, some visitors almost seem to appreciate the golf here even more. Coyote Moon and Old Greenwood - two courses in the little hip California High Sierra town of Truckee - are getting more and more buzz. This area is used to overcoming adversity. Weidinger remembers the fire about five years ago that closed down the Heavenly Gondola and forced him and his family to evacuate their home. "It's scary," Weidinger said. "Especially up here with the winter we had and how dry it is. It doesn't take much. "It's a miracle quite frankly that we didn't lose more than the homes. That no one died." With that perspective, a blow to the summer tourism season does not seem so bad. Most of the casinos hotels are reporting business close to usual, but smaller lodging properties have taken a hit. 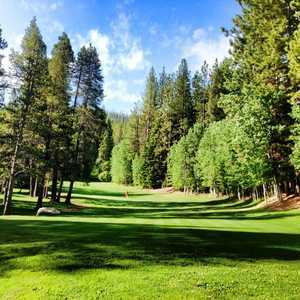 And while the showcase Edgewood still sells out, courses like the Lake Tahoe Golf Course are eager for more duffers to return. "It's coming back, but it's not 100 percent," McDade said. "Every weekend it gets better. I think the town's getting the word out." The word and the golf are good, with Lake Tahoe hoping its smoky days fade further and further from tourist memories.